In an effort to make longer journeys less tiring and a bit more pleasant I'm adding some sound deadening to the B.
Whilst it isn't unpleasant, it can get a bit old having to shout to a passenger or not being able to hear the radio on long trips, so I thought a little bit of noise reduction was a good way to go. To do this I bought a pack of Silent Coat damping mats and some acoustic underlay. 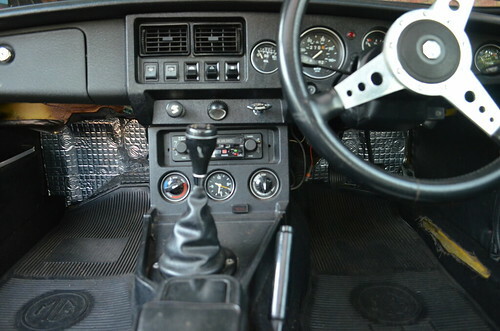 The damping mats come in at around a foot-square with a peel off backing which allows you to stick them to any surface in the car. they are also thin enough to mould around various bulges in the metalwork to get a good finish. These work by preventing the sheet metal from acting like a drum and so should make a fair difference if placed strategically. I put two in each door skin - on top of some existing stuff which looked to have been factory installed and not especially effective (there was also some underlay in the car too, but I'm guessing it was pretty ineffectual). The rest I put in the two footwells where they would hopefully also act as general noise dampers too. As Silent Coat is not expensive, I wanted to try something else in areas where I might want access later and not want to stick stuff to, so in the boot and under the seats (being mid-seat refurbish helps here!) I put down some acoustic rated carpet underlay. This stuff is rated to 35db so will hopefully both act in the same way as the Silent Coat in stopping vibration (where I've added it it will be pushed against the metal) but also have some general deadening properties too. So first drive today and? Well definitely quieter, easier to hold a conversation. The question is, would Silent Coat in place of some of the underlay make it more so?